This post is part of a recurring series about alumni of the Study of U.S. Institutes for Student Leaders for Public Policy and Government Leadership Program (SUSI) that is run by the U.S. Department of State’s Bureau of Educational and Cultural Affairs and Meridian International Center. For other posts about progress SUSI alumni are making in their communities, click here. As seen in a previous Meridian blog post, sports and diplomacy are often a perfect mix. Whether through large-scale international events such as the Olympic Games, or smaller scale projects like those implemented by the United States Department of State, sports have a unique ability of unifying people of different cultures. Sports can also encourage movements of social change or inspire individuals to take action to support a cause. Such was the case with SUSI Alumni Simay Sali, Yusuf Nural and Sefika Nilay Onatca. The three were stirred to make a difference when they received a letter from a gym teacher in Diyarbakir, Turkey. The teacher was put in a bind by the lack of physical education materials from the school. 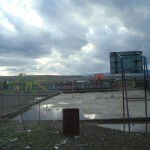 Although the school luckily had a good amount of outdoor space and a garden where the students could play and exercise, the school had nothing in terms of sports equipment. This lack of materials became even more of a problem whenever the P.E. teacher was given two classes at a time to teach—especially when the students were of different ages. Simay, Yusuf and Sefika were spurred to take action and help out the small school in Diyarbakir. The first priority for the school, as requested by the teacher, was to put up a wire fence around the large garden. That way, students could play multiple sports at the same time, enabling the gym teacher to accommodate two different age groups at a time in different activities. Simay, Yusuf and Sefika also plan on purchasing football goal posts, as well as a volleyball pole. Budget issues, though concerning to the team, did not deter them. The three are currently looking for local suppliers of the materials they need to cut costs. Furthermore, they are constantly expanding their project as they realize additional needs of the school. For example, the team discovered the Diyarbakir school had a library, but no books. The three organized a book collection drive, and sent geography, science, and children’s books to the school. The books had such a positive impact on the students that the school’s teachers decided to add supplementary reading time to the school day. The team’s flagship project in accordance with their dedication to sports is a Sport Village Festival that will take place annually on April 23rd, a meaningful day in the country. April 23rd is not only the Republic Day of Turkey, celebrating national sovereignty, but also, appropriately enough, Children’s Day. The day will feature different sports competitions for children from different regions. The Sport Village Festival team is also reaching out to national sports figures to get them to attend the festival to attract more attention to their cause. Perhaps the most rewarding part of the team’s efforts is the relationships they have created with the students and teachers at the school in Diyarbakir. Before the project, they knew no one in the eastern region of Turkey; now, they consider many of the students and teachers they have helped as family. In the future, the team hopes to not only meet with more students and school faculty, but also, “have a bigger family”.